$12.11 on Amazon look inside this book! 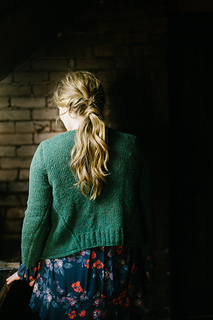 So much more than a cabled pullover, this garment is full of the construction details knitters expect from master designer Norah Gaughan. 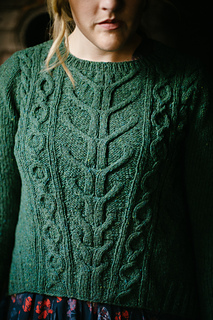 A pattern of cables reaches from hem to neckline in the heathery greens of Button jar, much in the way that new plants reach from flat plains to vast skies. With a curved hem and flattering A-line swing shape, this sweater feels feminine over flowy layers, or classic with jeans. 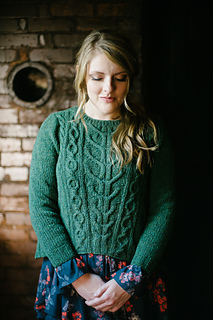 This sweater is shown in colorway Button Jar. The model, Sarah, is wearing her proper size, 36.5” - for a roomier, oversized fit, I recommend going up, but there is plenty of room in the recommended bust size.